The K2003 is close to the bottom of the line in quality when discussing new, single-ended triode (SET) amplifiers. Fortunately, it is also at, or near, the bottom end of the price scale. In reviewing this amplifier, two questions were kept in mind: Does it deliver quality audio performance in relation to its price? Second, how does it compare to other amplifiers within its price range? The world of single-ended, tube amplifiers has never been as well populated with high-end, high-quality, expensive hardware as it is today. With the price of most single-ended amplifiers reaching unobtainable levels for all but the most dedicated, obsessed, or wealthy audio enthusiasts, many of us who desire single-ended amplifiers were left with two choices: risk divorce, bankruptcy, or some other financial calamity, or buy decades-old, broken down equipment and try our hand at repairing them. Now, however, there are several new, almost affordable SET amplifiers worth considering. The K2003 is one of the least expensive offerings commonly available. What Is the K2003, and What Does It Offer? This amplifier is a small, simple, 2 x 4 W, stereo, power amplifier. It measures 25 x 19 x 11 cm, and weighs about 3.6 kg (10 x 7.5 x 4.5 inches, 8 lbs). Visually, this amplifier is not imposing or impressive; it is "cute". Despite its diminutive size, low power output, and positioning near the bottom of its respective market, Antique Sound USA has not skimped on the apparent quality of finish or the external components out of which this amp has been built. The K2003 is nicely finished in basic, matt black with exposed tubes and transformers. A chrome chassis (K2003 with chrome chassis pictured above) and screened cage are optional for additional cost. 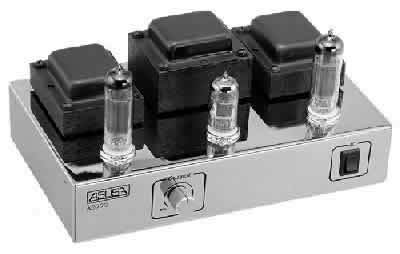 This amp uses a single 12AX7, dual-triode tube in the driver circuit, and one, EL84/6BQ5 output tube for each channel. The pentode output tubes are wired in triode mode with 5dB of negative feedback for a rated power output of 4 watts per channel RMS into 8 ohms. There is one pair of 8-ohm, speaker output taps. Distortion is listed by ASUSA as less than 1% at 1 watt, with a frequency range of 35 to 20,000 Hz at ±1dB. It also boasts hum and noise of -85dB. Original equipment tubes are all new production, Russian tubes made by Sovtek. Staying true to its budget design, retubing this amplifier costs as little as $20.00 USD. The RCA input plugs and three way, banana plug output connectors are all gold plated and located on the back panel next to the detachable, A/C power cord. According to ASUSA, this unit may be used with 100/117/230VAC @ 50/60Hz. A gain-control knob is located on the front panel next to the internally-lighted, on/off switch. The transformers are mounted horizontally and line up along the back side of the amp. The three tubes are located in front of the transformers. The K2003 uses point-to-point wiring throughout; there are no circuit boards. The wiring is neat with clean, bright, and professional quality solder connections. All observed resistors are carbon-film, 5% tolerance. One metalized polypropylene and five electrolytic capacitors are used in this amplifier. This amplifier is not tube rectified. Antique Sound USA recommends speakers with sensitivity of 91dB/1W@1M or higher. The speakers I used for the evaluation were B&W DM 602s with a rated sensitivity of 90dB/1W@1M, slightly less efficient than recommended. Initially, I was concerned that these speakers would not be sensitive enough for the modest power output of the amp and would require different speakers for proper evaluation. This concern proved largely unwarranted, although it was possible to push the amp beyond its capabilities. A single, followup test with a pair of Klipsch KSB 3.1 speakers quickly demonstrated that an additional 4dB of speaker sensitivity was very useful when maximum power output is only rated at 4 watts per channel. The source used for this evaluation was a Rotel RCD-955AX CD-player, used as a transport, with digital output through a silver coaxial cable to a California Audio, Sigma DAC. The DAC output was input directly into the amp; no preamplifier was used during evaluation. This amp does not play as though it has only 4 watts per channel. The presence and 'punch' of music played on the K2003 leave strong impressions. The highs are crisp and fairly well detailed, the mids are clean, strong, and very musical, and bass is reasonably strong and deeper than expected. It won't knock plates off shelves, but the strength of its bass is surprising for such a low-powered amp. Stereo separation is clean, and stereo imaging has a three-dimensional aspect more pronounced than I expected. The sound stage is reasonably wide and deep: it extends a little beyond the width of the speakers and starts somewhere behind the speakers. Clear, spacial separation of instruments in simple to moderately complicated music easily allows the listener to pick out locations of individual voices and instruments in 3-dimensional space. In very complex passages loudly played, location clarity was substantially reduced. The little amplifier seemed to be overstressed in music of this type while trying to drive the B&W speakers. The followup test with the Klipsch speakers supported this; high speaker efficiency is very important with this amplifier. The K2003 works well with electric rock music. Music such as Peter Gabriel's Mercy Street takes on a new character when detail becomes audible, while Family Portrait becomes downright eery. This amp definitely brings out the emotional content of this type of music, emotion that can be hidden when musical detail is lost or muffled in the signal path. Blues music sounds compelling and powerful. In Riding With the King, detail and subtle nuances of the vocal performance by B. B. King are clearly apparent. Orchestrated music generally sounds clean and detailed, with the exception of a little grittiness in some high end sound. This minor grittiness is not readily apparent to my ears during more complex work, such as Beethoven's Second Symphony or Rimsky and Korsokoff's Schaherizade. Pachelbel's Canon in D Major and Mussorgsky's Pictures at an Exhibition generally sound very smooth, clean, and detailed. However, where the K2003 really excels is in reproduction of acoustical instruments and vocals, female vocals in particular. The magic of single-ended amplifiers becomes readily apparent under these circumstances. Karen Matheson sounds so sweet and clear through this amp that she almost seems to be in the room, singing to an audience of one. Chrissy Hind's live performance with the Pretenders benefitted from the clean presentation provided by the K2003, allowing the subtleties of her performance to command the listener's attention. And, Shania Twain's playful performances are even more fun. Acoustic instruments take on a whole new magic. Listening to Eric Clapton playing a steel guitar, I am reminded that steel guitars don't have to sound like fingernails on a blackboard, an impression that often accompanies steel guitar playback on most low-end amplifiers. Stringed instruments in particular take on a dimension that is very satisfying in clarity and musicality. This amplifier lacks the high end smoothness of some, more expensive amplifiers. As previously mentioned, there is a little "grit" noticeable in the transients and highs of some music compared to more expensive amplifiers; violins in particular don't sound as smooth as they should. This only becomes readily apparent to me with certain pieces of music, such as Itzak Perlman's heartrending solo in Schindler's List. In all fairness, this grittiness is only obvious to my ears on relatively isolated, high-frequency sounds and is barely noticeable most other times. However, if I can hear it at all, serious audiophiles will, no doubt, be very annoyed by it. Some of the high-frequency grittiness can result from solid state rectification, such as used in the K2003. This amplifier is far more detailed than most in its price range to which I have listened. However, when compared to certain, select amplifiers, it sounds slightly muted, as though a cloth has been placed over the speakers. While Eric Clapton's steel guitar sounds wonderful on the K2003, some of the nuances of the instrument are lost, or worse, come across as indeterminate noise. This only becomes obvious when making an A/B comparison between the K2003 and a more detailed amp. In addition, some complex pieces of orchestration seem to lose detail during the most demanding passages, even during the followup test with the Klipsch speakers. In short, the K2003 seems to muffle some intricate, musical detail. The use of negative feedback in the circuit, which is supposed to 'stabilize the power supply' according to ASUSA, results in some loss of fine detail. It should be noted, however, that ASUSA chose a compromise with the negative feedback. While it is true that detail is lost, if there was no negative feedback, power output would be in the under 2-watt per channel range, which would exacerbate the problem of low power. When compared to most other amplifiers in its price range, the K2003 is very short of power. Most price-competitive amps are solid state designs with 100 or more watts per channel. That amount of power gives considerable flexibility as to which speakers can be utilized. The K2003 will choke on the inefficient speakers common to systems in this price range. Great care must be taken to match it with speakers at least 91dB/W@1M. Pairing this amp with ordinary, 86dB speakers would result in an overstressed amplifier that would severely clip and distort most music played. Good, high-efficiency speakers also tend to be very expensive, which is in direct contradiction to the idea of this being a "budget" amplifier for lower-income music lovers. Fortunately, there are several, reasonably-priced speakers that work well with it and still provide decent sound. Extensive speaker research and price shopping is required to get the most out of the K2003. In general, Russian vacuum tubes do not enjoy a reputation of good sonic quality when compared to new old stock (NOS) tubes previously made in Europe and the United States. Telefunken and Mullard, in particular, are highly sought because of the quality of sound they produce. Unfortunately, increasing demand is forcing prices of NOS tubes to very high levels. As an experiment, different tubes were substituted for the original, Russian-made tubes to find out how they would affect sound quality of the K2003. Several 12AX7 tubes were on hand, including Telefunken, Amperex, RCA, and the new Sovtek 12AX7 LPS long plates. In my opinion, the Telefunken provided cleaner, smoother, more musical sound than any other tube tried in the driver circuit. But, at about $60.00 USD per tube, this is a very expensive alternative. Instead, I found that the new Sovtek 12AX7 LPS provided sound quality that was nearly equal to the best, other than the Telefunken. The 12AX7 LPS cost only $9.00 USD and is in current manufacture. The Sovtek long plate was a noticeable improvement. Since this is a budget amplifier, budget tubes seem appropriate, especially if they can appreciably improve the sound of the amp. Amperex 6BQ5, Sylvania EL84, and Svetlana SV83 tubes were substituted into the output sockets. All but the Svetlanas seemed to be a slight improvement over the Sovtek tubes. The Svetlana SV83s are supposed to be built to higher standards than the Sovteks, but, having a lower plate voltage, they are not electrically identical to the 6BQ5 and did not work well in this K2003. The sound of this amplifier can be somewhat improved simply by substituting higher quality output tubes for the standard tubes. However, since the standard output tubes are only about $10.00USD for a new pair, and NOS tubes are $50 to $70 USD for a pair; price may become an issue to the budget minded. For my ears and wallet, it wasn't worth the price difference to use the scarce and expensive, NOS tubes. I have also been informed that the sound of the amp can be substantially improved by substituting high quality, film capacitors for the standard, electrolytic caps. The parts cost would be about $60.00 USD, plus installation (if you unable to do it yourself). I did not try this modification. By using a Telefunken 12AX7 and Amperex 6BQ5s combined with good quality capacitors, this nice little amplifier can be appreciably improved. However, now the total cost of the amp would rise to about $700.00 USD, not including labor costs for cap replacement. In addition, maintenance will now be more expensive as retubing will cost over $120.00USD instead of $20.00USD. Overall, I was impressed with the K2003. This is a well-made, reasonably-priced, SET power amplifier that exceeds expectations. It is small, but it has big sound. It is low-powered, but adequate, provided proper speakers are matched to it. It has reasonably smooth, musical sound when compared to many, more expensive amplifiers, and it is downright magical when compared to most other, comparably-priced amps. In appearance, the K2003, is not impressive. Its specifications are even less impressive. However, listening to the K2003 reminds me that high-fidelity equipment is far more than specifications and technology. It is not just reproduction of sound. Instead, it is, or should be, about listener involvement in music. If an amplifier is difficult to listen to because of distortion, harshness, clipping, excessive grittiness, or other problems that mask detail or overpower the music, emotional involvement may be elusive or unattainable. With an amplifier is as easy to listen to as this one, true involvement becomes possible. When matched with adequate speakers, you will find that this is a very good amplifier indeed, far outclassing most solid state and push-pull tube amplifiers against which it competes. However, it must also compete against other single-ended triode amplifiers, a class known for clarity of detail, smoothness of sound, and pure, musical output. Even though the K2003 is cheap by SET standards, it still costs $499 USD; this is a lot of money for people on a budget. Consequently, these same people generally try to get the most for money spent. Because the use of negative feedback causes slight muffling of detail, and because of the slight grittiness in the high end, I first would be inclined to shop around and carefully compare other, competing SET amps before buying this one. While this is a very good product, in my opinion, it is not the best in its price range.